dThis must be the dream of every LJ80 owner, driving the famous Paris-Dakar (called Le Dakar these days) rally in such a simple vehicle. In 1982 Josef Loder did just that, together with his navigator Alois Schneck! In the picture: Helmut Pohl, BMW driver in 1982 and friend of Josef Loder. Photo taken in Gao, Mali . The rally of ’82, the 4th Paris – Dakar in history, started under the Eiffeltower, on Januari 1st, 1982. 1st and 2nd of January where used to drive several time-rallys in Paris. The journey to Algeria followed on Januari 3rd. 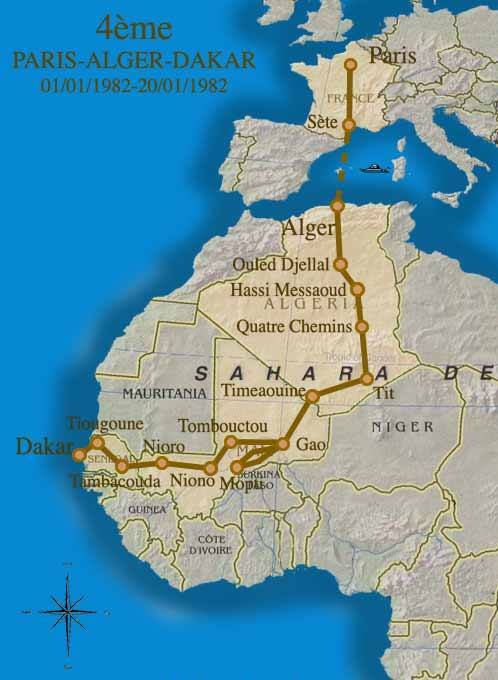 In Africa the countries Algeria, Mali, Mauritania and Senegal where traversed. In Mali, one of the stops was in the legendary Timbuktu (Tombouctou in French). The 9th of January was used as a resting day in Goa, Mali (picture above). The finish in Dakar was on the 20th of January. Loder/Schneck’s LJ80 was prepared by www.delta4x4.com . The alterations to the vehicle consisted of a 1000cc engine from an SJ410, tuned to 90hp using overhead camshaft, carburator and manifold. A 150lt fuel tank and dual shock absorbers where fitted. The top speed was 130km/h. Suzuki Germany supplier support during the race. In Algeria, after driving 3000km the equipe got into serious trouble with the gear box. Repairs took all day and the race had to be abandoned. Loder and Schneck continued to Dakar outside the race and reached Dakar in their LJ80. At the town border they took this great picture. Arrival at Dakar, left: Josef Loder, right: Alois Schneck. Josef Loder is now Managing Director of www.delta4x4.com . He still owns the LJ and drives it several 100’s of kilometers every summer. Josef Loder has also participated in the Pharaos Rally. As the picture shows, Loder’s LJ is still is good condition (photo taken around 2006). The original Dakar LJ, almost 25 years later. Among the contestants in 1982 was Marc Thatcher, sun of Magret Thatcher. At some point in the rally he got lost in the desert between Algeria and Mali. After extensive searching by the armed forces he was eventually found in a Touareg camp. As far as I have been able to find out a total of 4 equipes have tried to compete in the rally using Suzuki LJ80’s. Sadly, none of them made it to Dakar in the race. www.dakardantan.com provides a lot of historical information to spend an hour or two. Source text and photos: Josef Loder, many thanks!